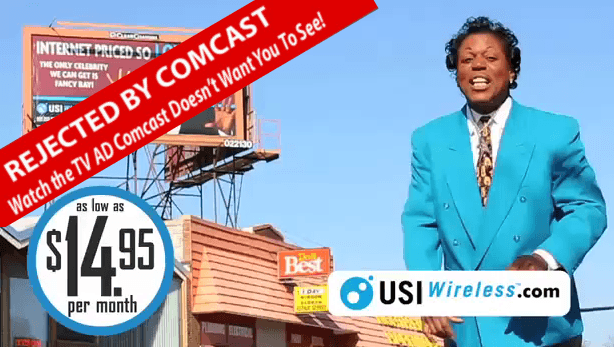 USI Wireless Archives · Stop the Cap! That question is posed on an enormous billboard over downtown Minneapolis. It comes courtesy of US Internet of Minnetonka, a tiny wireless provider competing against Comcast in Minneapolis. The Wi-Fi upstart has taken center stage in another dispute with Comcast that threatens to have national implications. For US Internet, the cable giant is already big enough to throw its weight around, because the Wi-Fi competitor has been notified it is not going to get its television ads seen by Comcast subscribers. That struck Joe Caldwell, CEO of USI Wireless, as anti-competitive. Comcast told Caldwell it could not run his ads because they are a competitor. USI Wireless charges $14.95 a month for wireless access across the city. Comcast charges between $40-115 for its standalone broadband service. USI got into some controversy with its earlier billboards, which raised more than a few eyebrows. McCloney adds salt to USI’s wounded bank account because, as he tells it, it was Comcast that invited him to produce the ad and get it running on the system. 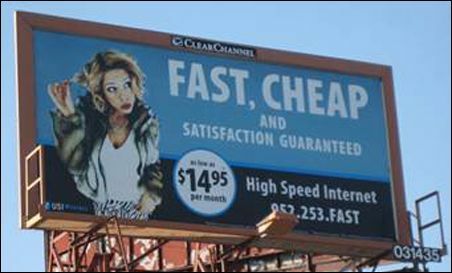 McCloney claims a Comcast advertising representative contacted him after seeing the billboard and invited USI to buy TV advertising. “They saw the billboards, and they asked if they could get some of that advertising business on Comcast cable,” McCloney told the Star-Tribune. After Caldwell spent $7,500 producing the TV ad, Comcast now says it cannot run on their system. A local Comcast spokesperson told the newspaper he didn’t know if McCloney’s story was true or not. A national spokesperson for the cable company said Comcast decides on a case-by-case basis whether to take advertising for services that compete with Comcast. The dispute threatens to have national implications as Comcast pushes to have its merger with NBC-Universal approved. With ownership of additional broadcast outlets, would-be competitors to Comcast could find themselves banned from advertising on broadcast stations with ties to the cable operator.